If your favourite pub moves – would you move too or look for another pub? For bacteria living in symbiosis with marine worms it all depends on whether they sit outside or inside the pub. Scientifically speaking: bacteria living on the body surface of their hosts are loyal to those, while bacteria living inside their hosts prefer to stay local, as scientists from Bremen now reveal. Nematodes and annelids. These are roundworms and segmented worms. They are just worms, one might think. „In fact, these two animal phyla are about as different as men and turtles”, says Judith Zimmermann from the Max Planck Institute for Marine Microbiology in Bremen, Germany. „And yet they live in symbiosis with very closely related bacteria.” This flexibility of symbionts of marine worms has now been described in a publication in Molecular Ecology. 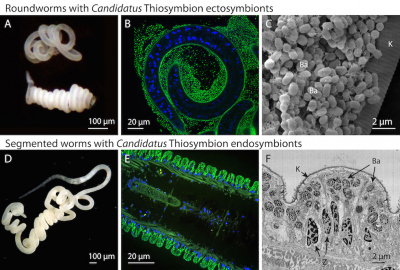 The symbiotic tenants of roundworms and segmented worms belong to a group of closely related bacteria named Candidatus Thiosymbion. These bacteria supply their hosts with nutrition. In the roundworms – in a subfamily called Stilbonematinae -, they live as ectosymbionts. “The bacteria cover the worm like a sleeping bag, only the head and the tip of the tail peek out”, Zimmermann explains. In contrast, in segmented worms – in the gutless oligochaetes –, the bacteria live as endosymbionts underneath the worms’ skin and feed their host so well that they have lost their mouth and gut. Despite their remarkable flexibility, however, the symbionts are very true loyal to their hosts in some concerns. Once again, Zimmermann and her colleagues were in for a surprise. Contrary to Zimmermann and her colleagues their expectations, the external tenants seem to show more long-term loyalty to their hosts than the internal cohabitants. „Long-term means over millions of years“, Zimmermann clarifies. „The host-symbiont-relationship is very stable for the roundworms and their bacteria. Apparently, they have co-evolved with each other without changing their partner.” Closely related roundworms were always associated with closely related symbionts. This high fidelity was seen in hosts from around the world, whether Zimmermann and her colleagues looked at roundworm-bacteria associations from Sylt, the Caribbean, the Mediterranean or Australia. The results of this study clearly show how flexible and full of surprises marine symbioses are. “Next we plan to investigate what determines the lifestyles of these symbionts“, says Nicole Dubilier, senior author of the present study and Director at the Max Planck Institute for Marine Microbiology. Which factors decide whether the Candidatus Thiosymbion-bacteria remain external and attached to the surfaces of their hosts or become internal and live under the worms’ skin? How do host and symbionts recognize each other? And do ectosymbionts become endosymbionts, or the other way round? Zimmermann, Wentrup and colleagues are looking forward to figuring out the answers to these questions and many more. Vertreter der in der vorliegenden Studie untersuchten Faden- und Ringelwürmer und ihre bakteriellen Symbionten aus der Gruppe Candidatus Thiosymbion. Auf den mittleren Abbildungen sind jeweils die Bakterienzellen grün und die Wirtszellkerne blau gefärbt. In den rechten Abbildungen sind die Symbionten mit “Ba” bezeichnet. (Quelle: J. Zimmermann (A, B), N. Leisch (C), C. Wentrup (D), M. P. Schimak (E), A.Gruhl (F), Max-Planck-Institut für Marine Mikrobiologie). Die Forscher sammelten die Würmer in einer Vielzahl verschiedener Regionen – hier die Sant‘ Andrea Bucht auf Elba und die Insel Carrie Bow Cay in Belize. Im Sediment beider Orte findet man mit eng verwandten Symbionten zusammenlebende Faden- und Ringelwürmer. (Quelle: C. Lott, HYDRA Institut (A), J. Zimmermann (B), MPI Bremen).